This highly adorable Shiba Inu had a severe skin disease (likely mange) that left her nearly hairless. So her owner began bathing her in undiluted, natural hot spring water, and her condition cleared up. Now this girl loves bath time! I love that dogs face ! I REALLY LOVE THAT DOG..GIVE HIM OR HER A BIG HUG ! MUAAH ! @Vietnamese dogs are pets not food! You are sick in the head. This is why people like you shouldn’t be allowed into our country. You are disgusting. If you weren’t starving I doubt you would eat it. Who can resist that smile?! Josey has “Blue Dog Syndrome” which has left her mostly bald. I wonder…? I’m sure I can find this in LA. That’s it Julianne we’re getting a Shibu. So cute!! So sweet, God bless you baby ! Bob I appreciate all your pics,you are a lovable guy with a big heart. Tricia Stegman Dean…isn’t this the breed you have? We have Basenjies. Similar. The Shiba Inu is like a Basenji mixed with a husky. 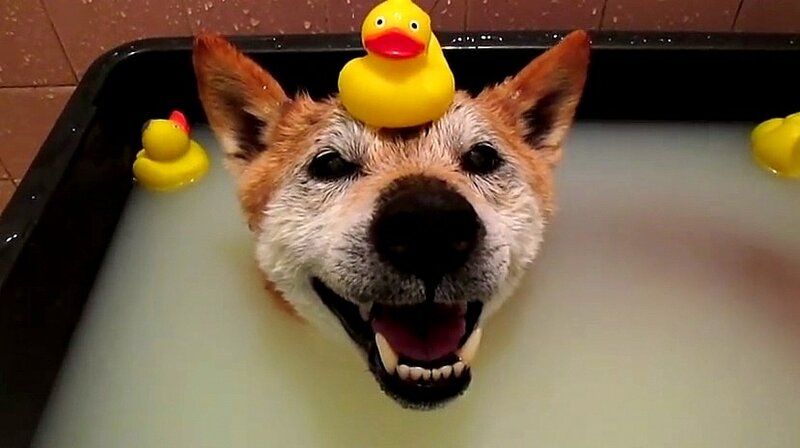 She looks very content in the water. This one’s for you, Ellie Andresen. One of my favorite breeds. Can be very protective. Hopefully, not really HOT water! I’m happy she got cured!